Night Haven, as illustrated for the Elanthian Times by HATESHI. 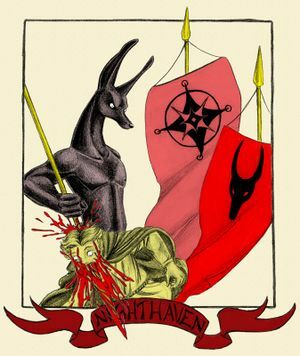 Nighthaven was the name given to the port of Solhaven the two times that the city was occupied by forces of the Dark Alliance during the Griffin Sword Saga under the command of the Sheruvian acolyte Draezir Moltoniron. During the time of the occupations, jackal headed onyx statues roamed the streets enforcing Draezir's will.